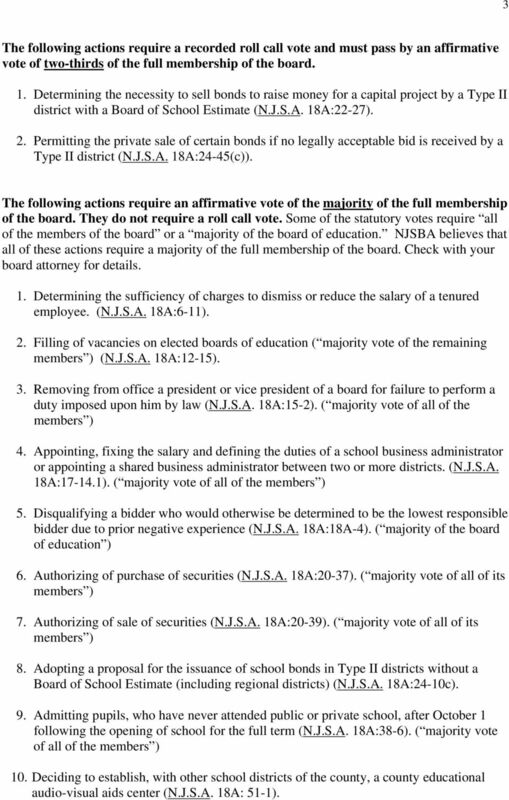 1 1 BOARD VOTING REQUIREMENTS The following actions require a recorded roll call vote and must pass by an affirmative vote of a majority of the full membership of the board. Full membership means the number of board members when all the members seats are filled. A majority of the full membership means a majority of that number. N.J.S.A. 18A: Directing the Board Secretary to make deductions for United States government bonds from salaries of participating employees (N.J.S.A. 18A:16-8). 2. 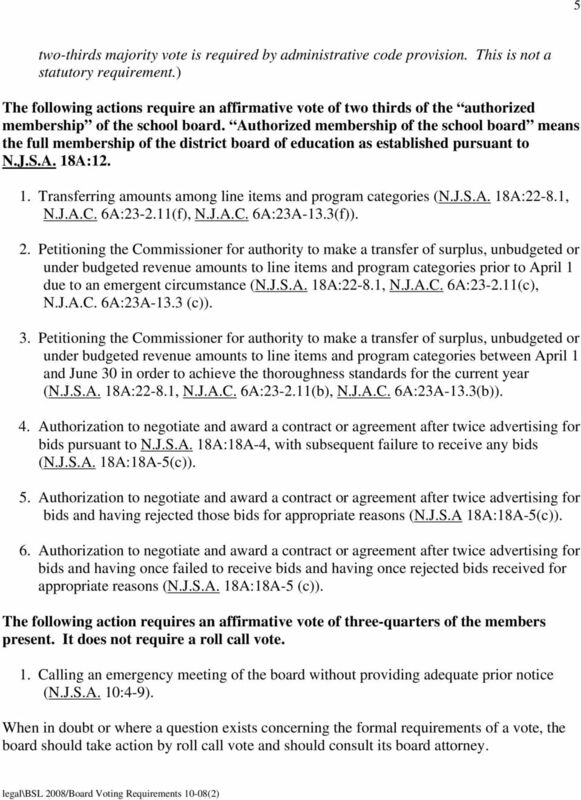 Appointing and fixing the salary and term of a Board Secretary (N.J.S.A. 18A:17-5). 3. Appointing and fixing the salary and term of an Assistant or Acting Board Secretary (N.J.S.A. 18A:17-13). 4. Appointing and fixing the term of a Superintendent of Schools (N.J.S.A. 18A:17-15). 5. Appointing or removing an Assistant Superintendent of Schools (N.J.S.A. 18A:17-16). 6. Appointing and fixing the term of an Administrative Principal (N.J.S.A. 18A: ). 7. Appointing and fixing the term of a shared Superintendent or a shared School Business Administrator (N.J.S.A. 18A: ). (Please note that this particular statute only requires a majority of the membership. 8. Appointing or removing and fixing the salary of a Business Manager in a Type I school district (N.J.S.A. 18A:17-25). 9. Appointing an executive superintendent in districts in cities of the first class with a population over 325,000 (N.J.S.A. 18A:17A-1). 10. Disposing of lands owned by the board, or rights or interests therein (N.J.S.A. 18A:20-5). 3 3 The following actions require a recorded roll call vote and must pass by an affirmative vote of two-thirds of the full membership of the board. 1. Determining the necessity to sell bonds to raise money for a capital project by a Type II district with a Board of School Estimate (N.J.S.A. 18A:22-27). 2. Permitting the private sale of certain bonds if no legally acceptable bid is received by a Type II district (N.J.S.A. 18A:24-45(c)). The following actions require an affirmative vote of the majority of the full membership of the board. They do not require a roll call vote. Some of the statutory votes require all of the members of the board or a majority of the board of education. 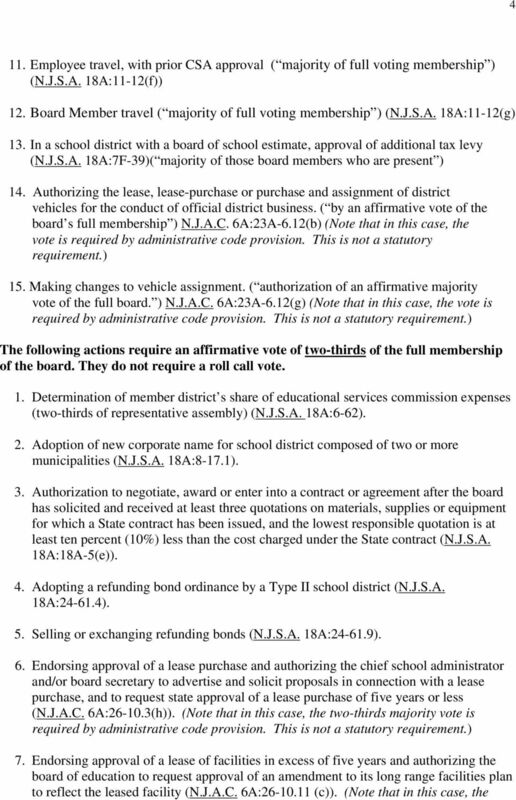 NJSBA believes that all of these actions require a majority of the full membership of the board. Check with your board attorney for details. 1. Determining the sufficiency of charges to dismiss or reduce the salary of a tenured employee. (N.J.S.A. 18A:6-11). 2. 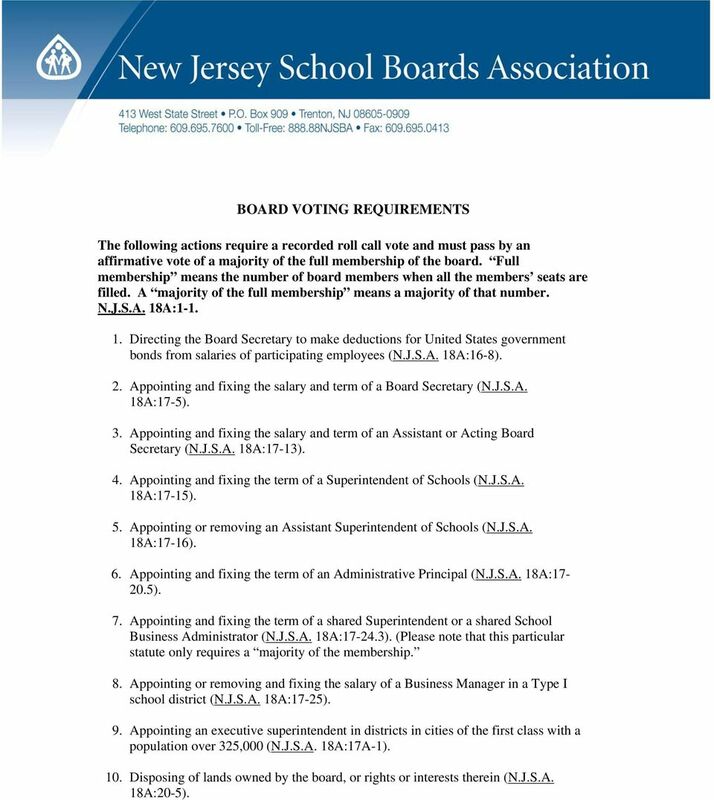 Filling of vacancies on elected boards of education ( majority vote of the remaining (N.J.S.A. 18A:12-15). 3. Removing from office a president or vice president of a board for failure to perform a duty imposed upon him by law (N.J.S.A. 18A:15-2). ( majority vote of all of the 4. Appointing, fixing the salary and defining the duties of a school business administrator or appointing a shared business administrator between two or more districts. (N.J.S.A. 18A: ). ( majority vote of all of the 5. Disqualifying a bidder who would otherwise be determined to be the lowest responsible bidder due to prior negative experience (N.J.S.A. 18A:18A-4). ( majority of the board of education ) 6. Authorizing of purchase of securities (N.J.S.A. 18A:20-37). ( majority vote of all of its 7. Authorizing of sale of securities (N.J.S.A. 18A:20-39). ( majority vote of all of its 8. Adopting a proposal for the issuance of school bonds in Type II districts without a Board of School Estimate (including regional districts) (N.J.S.A. 18A:24-10c). 9. Admitting pupils, who have never attended public or private school, after October 1 following the opening of school for the full term (N.J.S.A. 18A:38-6). ( majority vote of all of the 10. Deciding to establish, with other school districts of the county, a county educational audio-visual aids center (N.J.S.A. 18A: 51-1). TEXT OF PROPOSED LAWS. SECTION 6. Article XIX C is added to the California Constitution, to read: SECTION 7. CONFLICTING BALLOT MEASURES. Tashman Johnson LLC Consultants in Policy, Planning & Project Management AN OVERVIEW OF URBAN RENEWAL Tashman Johnson LLC Jeffrey Tashman 503.245.7828 Nina Johnson 503.245.7416 Fax 503.245.3171 6585 S.W. Holly C. Bakke, Commissioner, Department of Banking and Insurance. Steven M. Goldman, Commissioner, Department of Banking and Insurance. N.J.S.A. 17:1-8.1, 17:1-15e and 17:29AA-1 et seq. of exception to calendar requirement. AN OVERVIEW OF ARKANSAS TAX INCREMENT FINANCING DISTRICT LAW. Tax increment financing districts, otherwise known as "redevelopment" or "TIF"
Appointments will be awarded at the June Regular Business meeting of the Pine Hill Board of Education. R 8600/Page 1 of 5 R 8600 TRANSPORTATION General Requirements - Pupils Remote From School A. The Board will transport: 1. Pupils who reside remote, as defined in N.J.S.A. 18A:39-1. and N.J.A.C. 6A:27-1.2(a)1. Legislative Changes and Jurisdictional Updates, Effective July 1, 2013 Alabama: House Bill 112 (Act 2013 091) signed by the governor April 18 and effective July 1 amends existing unclaimed property law. Page 1 of 6 CONSTRUCTION MANAGEMENT AT RISK SCHOOL CONSTRUCTION ALTERNATIVE This policy is adopted pursuant to the Political Subdivisions Construction Alternatives Act (NEB. REV. STAT. 13-2901 to 13-2914). Ch. 35 COMMUNITY COLLEGES 22 CHAPTER 35. COMMUNITY COLLEGES Sec. 35.1. Scope. 35.1a. Statement of policy. 35.2. Statement of philosophy. 35.3. Definitions. 35.4. Visitations. GENERAL PROVISIONS 35.11. HB 15-1348 What does it mean to me? West New York Board of Education Special Meeting - Public Hearing on 2014/2015 Budget Minutes April 30, 2014, 4:30 p.m.